This is one of the very important topics that is frequently asked in competitive exams. 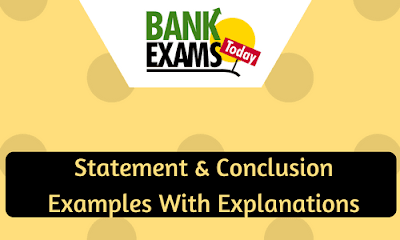 Theory on Statement & Conclusions has been published on 29-Jan-2017.It is better to have good basics on this topic. Assuming that the readers have gone through the theory, here we will discuss some examples. Directions: In each of the following questions, a statement is given followed by two conclusions I & II. Select the answer from the below list. The state government ‘B’ has sought a waiver of outstanding central loans of 5,000 crores & a moratorium on repayment pending the waiver. I. Unlike other states, state ‘B’ has no desire to make repayment of its loan. II. State B’s financial condition does not appear to be satisfactory. The conclusion I will not follow because it makes a comparison with ‘other states’. But in given statement, there is no mention of ‘other states’. Conclusion II will follow because seeking such loan waivers indicates the poor financial condition. Hence, option (2), only conclusion II follows is the answer. The executive board of MNM Ltd has asked its four regional vice-presidents to resign by the evening or face termination orders. Three of them put in their papers this afternoon. I. The fourth manager would resign by before the evening deadline. II. The executive board will terminate the service of the fourth manager, as soon as the deadline is over. From the statement, it is known that by the evening the managers should resign, failing which they would be terminated. Therefore, only one of the two conclusions could possibly happen but not both. Hence, option (3), either I or II follows is the answer. The constitutional amendment carried out in the monsoon session of parliament prohibits child labour in any organisation. I. All employers in the country must abide by this new rule. II. All the victims of child labour will now enrol in schools. The statement tells us that as a result of an amendment in the constitution children cannot be employed by any organisation. Since it is a constitutional amendment, all organisations should abide by it. So, the conclusion I follow. However, from the given statement we cannot deduce what these children would do once they are out of their jobs; hence conclusion II will not follow. Hence, option (1), the only conclusion I will follow is the answer. Security investments carry market risks. Hence it is best to consult your investment advisor or agent before investing. II. The investment advisor calculates market risk with certainty. The conclusion I am an extreme action, which suggests that one should not invest in securities. Hence, does not follow. The statement tells us that security investments are risky, hence it is advisable to consult an investment advisor. Obviously, we can conclude that the advisor is one who can predict or calculate the risk involved with certainty. Hence, conclusion II definitely follows. So, option (2), only conclusion II follows is the answer.